After posting this image online and after entering it in a PPA-style print competition, I got a lot of questions about its processing and how I put it all together, especially after telling folks that it’s a composite of HDR and strobist exposures.The image above is a combination of techniques and can seem complicated to put together, but just like anything else, when you break it down to its most basic parts and take it step by step, it becomes much more simple. Below, I’ll break down No Way Home to its basic building blocks to show you how it went together, but there is still more – I don’t go into detail too much about specific techniques. I really just wanted to illustrate what the different parts of the image are and how I developed the raw material to start building a finished product. While this is the first image of this type that I’ve shared here on my site, I’ve made a few others with this workflow that I’ve shared on my Google+ profile. You can find them on my profile there in the Predator Series Album. You can click any of the images on this page to see them larger (up to 1024px on the longest side) and they are annotated with relevant info for each image – exposure info or processing steps. The images are linked together in an on-page gallery and once the lightbox is visible, you can switch between images to see the changes by using your left/right arrow keys. FYI: All the images were shot on a tripod with a Canon 5D mkII through a EF 16-35mm f/2.8L lens at 20mm. Many times when you see composite images that use an HDR image for the environment, the subject is shot in the studio with lighting and then placed into the environment. In the example here, the bus stop/environment were shot in a bracket (0,-2,+2) to be processed as an HDR and my buddy, Toby, was shot in a separate exposure with a flash, but still at the bus stop. I also shot one extra frame that was 4 stops darker than the bracket’s base exposure to ensure that I would have enough detail in the light-up map in the bus stop and any other bright lights in the environment. I like to take the processed image and load it into a stack with the original exposures in Adobe Photoshop . Then, usually starting with the darkest exposure first, I’ll apply a mask to the top layer (the processed HDR) and hand blend in details from the layer below it. Once I’m satisfied with the blending, I’ll merge the two layers and repeat with the next layer in the sequence below it. In this case, I also blended in the extra fourth layer to take care of any really bright lights and the lighted map behind Toby in the bus stop. When I had the HDR environment and subject images adjusted to a point that I was comfortable with both, I loaded them into a stack in Photoshop with the HDR image on top. Using a mask applied to the HDR image, I brought the image of Toby through to blend with the HDR. Other adjustments to the overall shot included some dodging/burning, vibrance adjustment, and adding contrast/sharpening with just a bit of Topaz Labs Adjust 5. At this point, the image looked pretty good, but I saved the result in Photoshop and made final color, tone, and lighting adjustments in Lightroom 4. The right side of the image was a little bright and I wanted to shift the POV over to Toby as much as possible, so I added a graduated filter adjustment to bring the exposure down a little. Your eye tends to track to the lightest and sharpest areas of an image, so while the environment played an important part of the scene, Toby really was the main focus and needed to stand out the most. The image as shown at the top is a slightly different crop than the one that I originally posted on Google+ and Facebook. I cropped a little bit extra off of the left side of the frame before I entered it into the August print competition at PPGBA and it scored an 86 in the PPA-style print competition. I was pretty stoked to win my category, but it was also the highest scoring image of the night, so it also won print of the month for August! Another Merit Photo @ the Print Competition San Francisco Seven Sisters – Girls Night on the Town Welcome to the Hive – San Jose City Hall in HDR Hand-held HDR and SF Financial District Night Image of the New San Francisco-Oakland Bay Bridge! 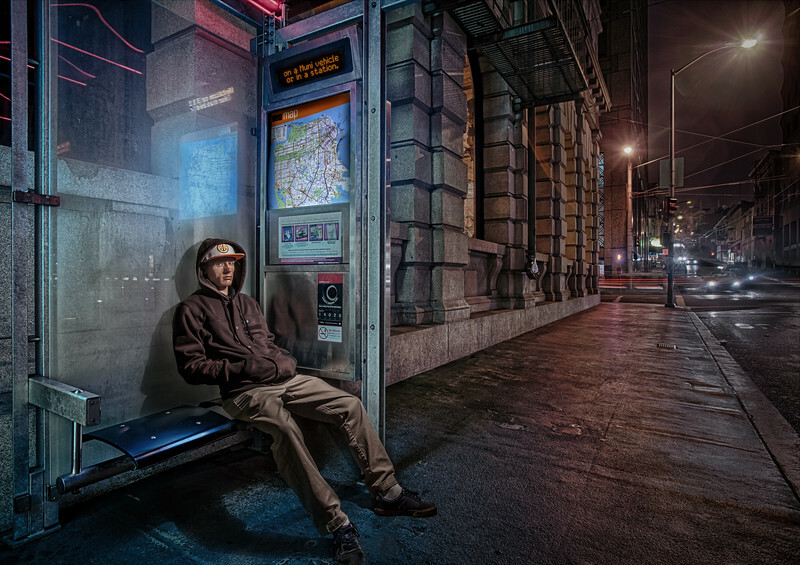 This entry was posted on Tuesday, August 21st, 2012 at 10:14 am	and is filed under Blog, Tutorials and tagged with bus stop, composite, downtown san francisco, exposure fusion, HDR, hoodie, image blend, San Francisco, stranded, street photography, strobist. You can follow any responses to this entry through the RSS 2.0 feed. Really liked your process flow and the explanation. I Would still like to see the steps you follow to bring Toby into the adjusted tonemapped image. Did you just mask it in or cut it out and place it. I always have a hard time if I try to blend the way you mentioned. Thanks. I layered in the image of Toby below the layers of the environment and brought him in using a mask. Some of the tricky things about doing it are ambient light color temperature and making sure to include the shadows. I usually use a really soft brush with the opacity turned down (about 10-20%) to blend, but in some cases where there is a hard edge, I’ll create a selection from a path using the pen tool to brush right up to a hard edge. Just stumbled onto this from your post about lightroom keyboard shortcuts. Very impressed with the setup and the compositing elements on this. Did not realize that you did the scene first and added Toby later. After seeing it deconstructed, kinda feels like his foot is floating but that may just be me. Good call… I could probably add a little more shadow around his foot. Looking at how the light falls on the top of his shoe, it looks like the area under the arch of his foot could use some shading. Thanks for looking out, I’ll keep that in mind more next time! You’ve hit the ball out the park! Indcreible!